REWIND! 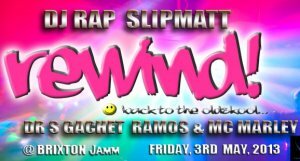 Back to the old skool return on Friday 3rd May 2013 to take you on an all-night journey between the two states of mind! Fusion, Strict, Twilight, Dizzy, Lyrical Groover, Darksta, Supa V and MC Max.